Some little facts about Mombetsu, it's a city in the northeast of Hokkaido. The name Mombetsu came from "Moupetto" (calm river), a word of aboriginal Ainus of Hokkaido. I did some quick research before my trip to Hokkaido since I've never heard about a city called Mombetsu before. I found out that their specialities is crab which is reputably the best in Japan. Monbetsu is also famous for drift ice, a yearly phenomenon which reaches the city every January or February from the northern Sea of Okhotsk. So what to do in Mombetsu ? 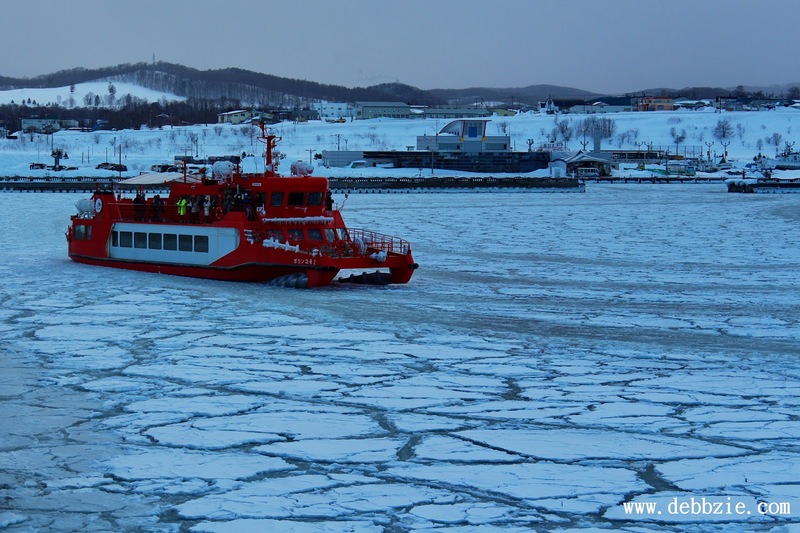 I was lucky to be in Mombetsu during winter and the yearly Drift Ice Festival, so I was able to experience the icebreaker cruise (January to March only). 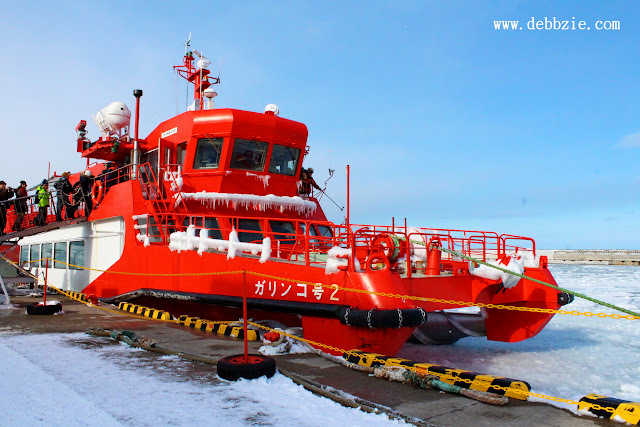 The name of the ship is Garinko-go II, used to pave the way for nautical routes so that other ships could still use the freezing oceans in winter to transport cargo. It was awesome and fun.....apart from freezing cold weather. I insisted to stay on the open deck during whole trip (more than 1 hour), because I want to take pictures. It was snowing quite hard during the cruise and the temperature drop to minus 18C. I was shivering and wet. My face was frozen that I couldn't smile, as if I've done too many botox, lol. My hands looked really red and it was hard to move even to press the shutter button. Glad I did that though, had I spent my time in the warm and cosy cabin, I wouldn't see and experience much. I love hearing the sound of ice cracking and breaking up. But it's not everyday I can pet a seal, right ? 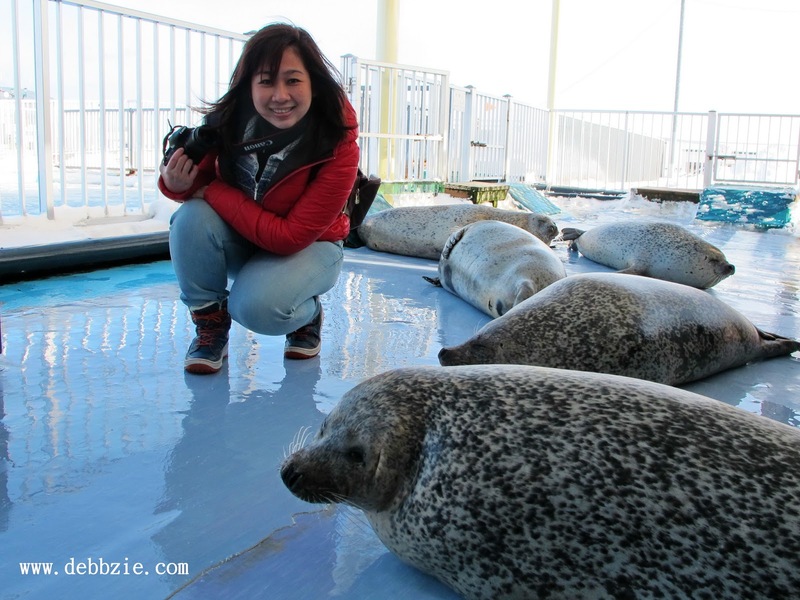 Not only one but there are about 30 beautiful seals which are called "Goma-Chan". Their fave food is Hokke fish, another speciality from Hokkaido. It's the first underwater drift ice observatory in the world. There's a a 360-degree observation lounge on the third floor, where you can see all the way from the sea to the Shiretoko Mountain as well as an outdoor balcony cafe. But most important we can see all kinds of sea creatures in their natural habitat all year round. It's where I first saw the tiny transparent sea creature called Sea Angels. I haven't even heard about this creature before. I was so curious and when I finally caught a glimpse of it, I was in love. To me, sea angels are such beautiful creatures. They can only live in cold water with temperature between minus 2 to minus 10 Celsius. They "fly" in the water in a graceful moves using their 2 wings alike, thus they're called Sea Angels. I just couldn't get enough looking at them. I was staying at an onsen resort called Mombetsu Prince Hotel. 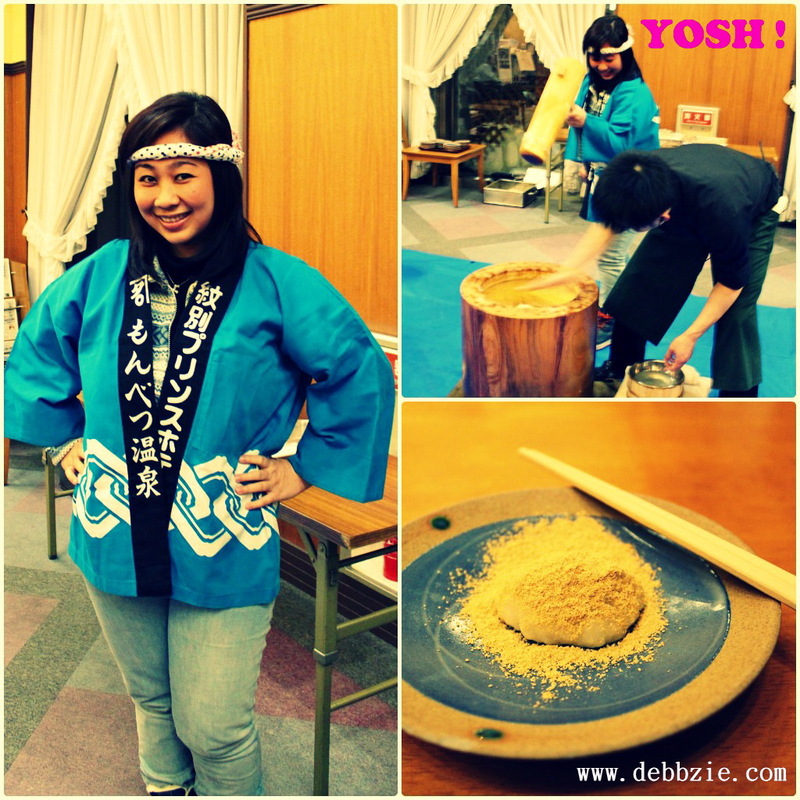 At night they have an interesting program, the mochi making. So those who want to participate should wear this cute outfit including the headband. And will be given the chance for pounding mochi while others shouting "Yosh!" as a rhythm for pounding. It was quite heavy but so much fun. And the mochi was delicious. Overall, I really enjoyed my time in Mombetsu. Also I found the people were generally very friendly. It still amazes me that when we were checking out from hotel, the hotel manager and staff send us to parking lot then bowed several times and waved their hands until our car disappeared from their sight. It touched my heart, seriously. I've never had that kind of kindness in any other countries. The seals look so cute (and lazy at the same time)! Icebreaker crusie cuma ada bulan January sampe Maret aja. wow makan mochi bikinan sendiri hhahaha kerennnn!! Gilaaaaa ... itu -20 derajat giman arasa nya ???? BTW knpa mochinya harus dipukul2 pke palu segede itu mbk?? Duuhh saljunya tebal sekali, kalau saya sih ga tahan deh lama-lama di sana. Itu Sea Ice Museum bagus sekali :). Hahaha absolutely love the photo of the smoking snowman! Nothing can beat it. I would love to visit the . Seal Conservation Centre and feed some of the seals there. My dream! Itu ikan2nya dalam balok es Deb yang di Okhotsk Sea Ice Museum ? Meski udah 2 tahun yg lalu, namun pengalaman kamu ini seru banget. Pengalaman ke Hokkaido emang bukan cuma melihat pemandangan aja, tp bisa menjelajah dan merasakan pengalaman layaknya orang2 lokal setempat. That was cool! Kunjungan berikutnya, mungkin aku mau coba ke tempat2 yg udah kamu kunjungi itu, Mombetsu, Noboribetsu, dll. Thanks for share your story, Deb..